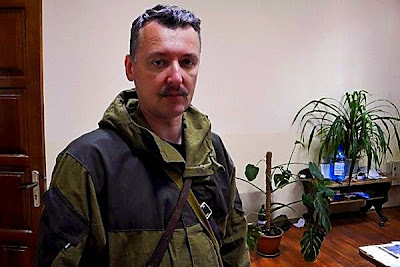 MOSCOW, Russia -- Igor Vsevolodovich Girkin, also known as Igor Ivanovich Strelkov, born on 17 December 1970, is a Russian citizen from Moscow who commands the Donbass People's Militia paramilitary group and is the key figure behind the 2014 pro-Russian conflict in Ukraine. Igor Girkin, who goes under the "nome de guerre" Igor Strelkov is the commander of the pro-Russian rebels in Ukraine. Strelkov was charged by Ukraine authorities with terrorism and is currently sanctioned by the European Union for his leading role in the insurgency in eastern Ukraine. According to Ukrainian and EU authorities, Girkin is a retired Russian military intelligence GRU colonel who has previously participated in the 2014 Crimea crisis. In early April 2014, Girkin arrived in the city of Slavyansk where the self-declared "people's mayor" Vyacheslav Ponomarev gave him the command over local militant group. On April 15, the Security Service of Ukraine (SBU) opened a criminal proceeding against "Igor Strelkov". He was described as a Russian recruiter and leader of armed "saboteurs" and a chief organizer of the "terror" in Ukraine's Slavyansk Raion (including an ambush that killed one and wounded three SBU officers), who had previously coordinated Russian military takeovers of Ukrainian units in Crimea during the 2014 Crimea crisis in March. The next day, he allegedly sought to recruit Ukrainian soldiers captured at the entrance to Kramatorsk. The SBU presented Strelkov's presence as proof of Russia's involvement in the East Ukraine crisis and released intercepted telephone conversations between "Strelkov" and his handlers in Moscow. Russia denied any interference in Ukraine by its troops outside Crimea. The Ukrainian government said Strelkov was behind the April 17 kidnapping, torture and murder of a local Ukrainian politician Volodymyr Rybak and a 19-year-old college student Yury Popravko. Rybak's abduction by a group of men in Horlivka was recorded on camera. The SBU released portions of intercepted calls in which another Russian citizen, alleged GRU officer and Girkin's subordinate Igor Bezler orders Rybak to be "neutralized", and a subsequent conversation in which "Strelkov" is heard instructing Ponomarev to dispose of Rybak's body, which is "lying here [in the basement of the separatist headquarters in Slavyansk] and beginning to smell." Rybak's corpse with a smashed head and multiple stab wounds was found later in April in a river near Slavyansk; Popravko's body was also found nearby. The incident helped to prompt the government's "anti-terrorist" military offensive against the pro-Russia separatists in Ukraine. During the weekend of April 26–27, the political leader of the separatist Donetsk People's Republic and Girkin's old friend, Alexander Borodai, also a Russian national, ceded control of all separatist fighters in the entire Donetsk region to him. On April 26, "Strelkov" made his first public appearance when he gave a video interview to the Komsomolskaya Pravda where he said that his militia in Slavyansk was formed in Crimea and consisted of volunteer veterans with combat experience from the wars in the former Yugoslavia, Iraq, and others (mostly from the Russian Armed Forces); it included many Russian and other foreign citizens but was mostly ("more than half, maybe two-thirds") locals. He said nothing about his own background, denied receiving weapons or ammunition from Russia, and announced that his militia would not release the Organisation for Security and Co-operation in Europe (OSCE) observers that it had taken hostage unless pro-Russia activists would be freed by the Ukrainian government. On April 28, the EU sanctioned "Igor Strelkov" as a GRU staff member believed to be a coordinator of armed actions and a security assistant to Crimea's Sergey Aksyonov. On April 29, Girkin appointed a new police chief for Kramatorsk. According to a report issued by the Office of the United Nations High Commissioner for Human Rights, "reportedly, on 26 May, by order of Igor Strelkov, Dmytro Slavov ('commander of a company of the people’s militia') and Mykola Lukyanov ('commander of a platoon of the militia of Donetsk People’s Republic') were 'executed' in Slavyansk, after they were 'sentenced' for 'looting, armed robbery, kidnapping and abandoning the battle field'. The order, which was circulated widely and posted in the streets in Slavyansk, referred to a decree of the Presidium of the Supreme Council of the USSR of 22 June 1941 as the basis for the execution." "A particular call for women to join the armed groups was made on 17 May through a video released with Igor Girkin 'Strelkov', urging women of the Donetsk region to enlist in combat units." Slavyansk's separatist "people's mayor" and former boss of Girkin, Ponomarev, was himself detained on an order of "Strelkov" on June 10 for "engaging in activities incompatible with the goals and tasks of the civil administration" and disappeared; according to rumors, he too was executed. On the night of July 4-5, during a large-scale offensive by Ukrainian military following the end of a 10-day ceasefire on June 30, Girkin and his militants fled from Slavyansk which was then captured by Ukrainian forces, ending the separatist occupation of the city which had started on April 6. Shortly before this happened, a video was posted on YouTube in which Girkin desperately pleaded for military aid from Russia for "Novorossiya" ("New Russia", a separatist name for eastern Ukraine) and said Slavyansk "will fall earlier than the rest." Other rebel leaders denied Girkin's assessment that the insurgents were on the verge of collapse. One of them, the self-proclaimed "people's governor" of Donetsk Pavel Gubarev, compared Girkin to 19th century Russian general Mikhail Kutuzov, claiming that both "Strelkov" and Kutuzov would "depart only before a decisive, victorious battle." Other activities In late April 2014, Strelkov was identified by Ukrainian intelligence as Colonel Igor Girkin, registered as a resident of Moscow. Journalists visiting the apartment where his mother allegedly lived were told by neighbors that a "fancy black car" had that morning picked up the woman living there; the neighbors also described him as "polite" and "quiet". Girkin is known as a fan of military-historical movement and has participated in several reenactments connected with the Russian history. Vice News stated that "during the 1990s, Girkin wrote for the right-wing Russian newspaper Zavtra, which is run by the anti-Semitic Russian nationalist Alexander Prokhanov" and where Borodai was an editor. If Ukraine is having troubles capturing Strelkov, it should enlist the help of the Israeli Mossad. The Mossad are experts at quick surgical removal of subjects of interest. Strelkov could then be taken to the International Criminal Tribunal, at the Hague, to be tried for war crimes. This idea sounds just fine to me, and it will have a demoralizing effect on the Insurgents. Some would bolt back to Russia no doubt.